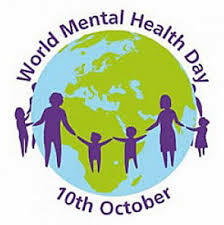 Today is World Mental Health Day, the annual global celebration of mental health education, awareness and advocacy. Every year on 10 October we join together in shining the spotlight on a particular aspect of mental ill health. The theme for 2015 is Dignity in Mental Health. All week here at Cardiff University we have been promoting awareness of mental health through ‘Mind Your Head Week’ organised by your VP Welfare, Kate, to get people talking and help reduce the stigma of mental health. ‘Mind Your Head Week’ has raised awareness through providing activities, games and information. From Lego and Dance Therapy to Inner Child Day – who can forget those adorable dogs?! The World Health Organisation (2011) estimated that approximately 450 million people worldwide have a mental health problem. According to the Office for National Statistics (2001), 1 in 4 British adults experience at least one diagnosable mental health problem in any one year, and 1 in 6 experiences this at any given time. Mixed anxiety & depression is the most common mental disorder in Britain, with almost 9% of people meeting criteria for diagnosis and between 8-12% of the population experience depression in any year. Look around where you are sitting now reading this – that means that if you have one person to your left and two people to your right, the likelihood is that one of you will need support with issues such as depression and anxiety at some point this year. Many people who live with a mental health problem, or are developing one, try to keep their feelings hidden because they are afraid of other people’s reactions. Many people also feel troubled without having a diagnosed, or diagnosable, mental health problem – although they could still be struggling to cope with daily life. *Information has been provided by the Mental Health Foundation. Our Counselling, Health and Wellbeing Service are located at 50 Park Place. We are here to help you with any problem, regardless of how big or small you feel the problem might be. We have friendly and approachable staff who are able to listen to you non-judgmentally, in a safe and confidential space. Please access our drop-in from Monday-Friday 3-3:45pm for a 10-15 non-bookable appointment to have an initial chat with us or, alternatively, please refer into our service by completing our referral questionnaire. If you are feeling suicidal or at risk of harm we would strongly advise you to make an urgent GP appointment to discuss this. If you are yet to register with a GP, please find a GP.